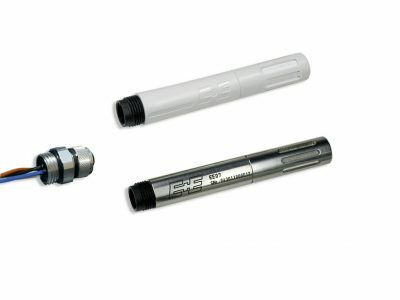 The EE07 digital probe is available in polycarbonate and stainlees steel enclosure and measures accurately humidity and temperature over a wide temperature range. With the choice of appropriate filter cap EE07 is suitable for a variety of demanding applications. The compact design and M12 connector allow an easy system integration. For meteorology and other outdoor applications, the EE07 can be used with the optional radiation shield. Probe setup and adjustment can be performed with an optional configuration kit. EE07-02 is an EE07 version optimized for very low power consumption, ideal for battery powered measurement devices.